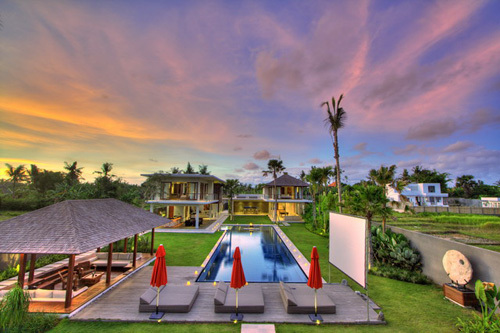 Luxury 5 bedrooms - Villa Kalyani, meaning ‘beautiful’, is a spectacular property resting on 2400 square metres of land, just 800 meters from the beach near Canggu on Bali’s southwest coast. No expense has been spared in the creation of this luxurious, custom-designed, hi-tech villa, complete with five-bedrooms each with audio-visual facilities, seven bathrooms, two swimming pools, a dining room, a playroom, an open-sided living room, a sunken ‘bale’ lounge, an air-conditioned home theatre as well as an outdoor cinema with a 250-inch screen, a rooftop entertainment terrace with 360 degree views, two bars, a DJ booth, and a professional kitchen. The main two-storey building is built in a horseshoe shape facing an extensive flat garden and 22-metre swimming pool, while the two-bedroom guest pavilion also presents a living area and plunge pool. The villa is decorated with local artefacts, stone carvings, and a collection of stunning paintings by Indonesian artists, all of whom have had solo exhibitions at Seminyak’s prestigious Kendra Gallery.Kalyani has a customized sound system comprising of a network of Bose speakers throughout the villa which makes it perfect for weddings and events. This remarkable holiday villa in Bali offers numerous relaxation areas, so guests will always find a private spot for peace and quiet. Perfect for families and groups of friends, it offers a captivating blend of luxury, recreation, privacy and exemplary service. There are covered walkways around the main building, an ornamental pond, and a secure parking area at the front of the property. As an added bonus, guests at Villa Kalyani are entitled to membership of the neighbouring Canggu Club for the duration of their stay, which provides a restaurant, bar and lounge, library, kids’ club, floodlit and indoor tennis courts, air-conditioned squash courts, a 25-metre swimming pool, gym and aerobics centre, indoor sports hall, sauna, and a billiard lounge. There are five air-conditioned bedrooms at Villa Kalyani, all with en-suite bathrooms. The two master rooms are situated in separate wings on the upper floor, there is one guestroom on the ground floor of the main building, and there are a further two guest suites located at ground level within the self-contained guest pavilion on the far side of the swimming pool. Additionally, the air-conditioned home theatre can also be used as an extra bedroom with two comfortable upholstered daybeds, which can be made up as double queen size beds. For this purpose, a guest bathroom with rainshower is located just a few metres away from the home cinema. Each bedroom features brushed marble floors, and all are furnished with king-size beds, wardrobes, desks, chairs, shagpile rugs, bedside tables and lamps. In one of the guestrooms, the king bed can be converted to twin beds. Every bedroom boasts an LCD satellite-channel TV and DVD player, and WiFi Internet access is available throughout. All ensuite bathrooms have non-slip Indian slate floors, walk-in rainshowers, twin washbasins and huge wall mirrors. The master bedrooms have dressing areas and one of the master bathrooms boasts an enormous 196 x 180 cm bathtub beside a private rooftop garden enclosed by living bamboo. The two self-contained guest suites share an open-air living room complete with a kitchenette and a 7 x 3 metre plunge pool. One of the guestrooms is known as the VIP Room because its ensuite bathroom has a bathtub that appears to float upon a lily pond, flanked by a water cascade. The dining room is located on the ground floor of the main building, overlooking the garden and pool; it features concertina glass doors that can be closed for air-conditioned comfort or folded open for a semi-alfresco dining experience. The room is furnished with a solid wood table which comfortably seats 14, complete with comfy upholstered dining chairs. Music and soft lighting emanates from speakers and downlights in the ceiling. To one side of the dining room is a bar with a black polished granite top, a decorative stacked limestone façade, and four barstools. Next to this bar is the open-sided playroom, which is cooled by ceiling fans, equipped with a full size pool table and another set of hidden speakers, and furnished with a large L-shaped sofa, ottoman and a rustic coffee table. The state-of-the-art home theatre is characterised by dark red walls and ceiling, dark red blackout curtains, and some funky, conceptual multi-media artwork. Two huge and comfortable, contemporary-styled daybeds take up the length of the back wall. This air-conditioned room is equipped with a 130-inch screen, supported by surround sound and a projector for showing movies and DVDs, in addition to satellite TV channels. Ninetendo Wii is also available and can be transferred to the outdoor cinema, if required. The open-sided living room is cooled by natural breezes and ceiling fans and softly lit by downlights. This stylish contemporary living space is furnished with comfy segmented sofas and a glass topped coffee table. Two speakers bring music into this area and a floating two-toned suar wood staircase is a striking feature, which leads up to the master bedrooms and rooftop sundeck. The roof of the main two-storey building serves as a sundeck, offering fabulous views of the rice fields. This is a lovely private area for sunbathing or chilling out, furnished with two double daybeds and a red umbrella. To one side is a romantic ‘floating’ swing bed, which is literally a double, deeply cushioned daybed that hangs from the roof and gently rocks its occupants while shading them from the sun. There is another rooftop deck above the guest pavilion, surrounded by pink bougainvillea. This breezy space is ideal for parties and entertainment or for enjoying the magnificent views and sunset from the romantic bale relaxation pavilion, which is draped in white muslin. From here you can see the Bukit Peninsula as well as the mountains on a clear day. Next to the living room and extending poolside, complete with a timber decked floor, is the garden bar and DJ Booth. The Pioneer Pro DJ equipment with deck, mixer, effector and accessories is provided for the use of professional DJs only at parties and events, but the player sound system is available for guest use, with speakers in every area of the villa apart from the bedrooms. The well-stocked polished black granite bar is flanked by seven fixed bar stools fashioned in chrome and black leather. Adjacent are four very chic and comfy black armchairs positioned around two small drinks tables crafted from solid blocks of wood. The timber deck here doubles as a dance floor. The ‘bale’ relaxation pavilion has a soaring roof, which protects guest from the sun and ensures that they are always in the shade. Cooled by two ceiling fans, this innovative sunken garden lounge, complete with surround sound, presents a sitting area with two sofas, two chairs and a coffee table. Bordered by the timber pool deck, guests can sit here in comfort and watch movies on the massive 250-inch outdoor cinema screen. This is also a great facility for private functions and weddings. Cleverly disguised speakers rest upon the deck, and the daybeds can be turned to face the screen. Villa Kalyani’s immaculate, designer kitchen reveals a discriminating taste for functional beauty and cutting-edge style. This professional kitchen is crafted in gleaming white marble with a central island and ample storage. It is fully fitted and fully equipped with two imported ovens, a five-burner hob, a built-in microwave, two large refrigerators, a wine cooler, a cappuccino maker and everything else that the chef needs in order to prepare delicious meals. The expansive garden comprises a flat lawn punctuated with towering coconut palms and flowering shrubs. The central feature is the sparkling 22-metre swimming pool, which incorporates a three-metre shallow area suitable for kids. The ambience at night is enhanced by a firebowl, which is lit at sunset. The pool is bordered by a timber deck furnished with three double daybeds and red umbrellas in true KuDeTa-style. Fresh food is prepared daily by the accomplished Chef Gede, who previously worked with the internationally- renown Kafé Warisan in Bali, and also spent time honing his skills in Japan. He specialises in French, Continental, Asian and Japanese cuisines. The Villa has a house menu to provide ideas for meals, which the chef will tailor to suit guests’ needs by discussing food preferences. Dinner parties, functions, unique dietary requirements and special orders can all be catered for, and meals can be a simple affair or a grand banquet according to guests’ whims. Food products and drinks are purchased in well-stocked supermarkets and delicatessens, or in the local markets where the fresh healthy produce is especially good and inexpensive. Guests are asked to pay for the shopping at the time of ordering the food, upon purchase of which all receipts and change will be returned. The only additional charge above menu ingredients is a modest amount to cover the transportation cost. Villa Kalyani offers a standard of service and privacy that exceeds hotel levels. The staff are specially trained to be discrete and will never disturb guests while they are in their rooms. The staff team comprises one manager, one chef, four butlers, one pool attendant and two security guards. All are devoted to attending to guest needs with immaculate, unobtrusive service. Villa Kalyani is located within the beautiful agricultural belt between Kuta and Tanah Lot, an area that is home to some of the most luxurious private residences on the island. This out of town setting offers the double attraction of being close to the shops and restaurants of Seminyak, while also presenting a fascinating insight into the traditions of rural Bali. Cows are herded through the fields, rice is planted and harvested throughout the year, and the sound of ritual music is carried on the breeze. On a clear day, the rice field view from Villa Kalyani is enhanced by the magical sight of Bali’s mountains. The trendy areas of Seminyak and Petitenget (15 minutes drive), offer a wide choice of international restaurants, including the famous ‘KuDeTa’, Metis, ‘Living Room’, ‘Hu’u’, ‘La Lucciola’, ‘Sardine’ and ‘Sarong’, as well as plenty of bars, nightspots, designer boutiques and lavish spas. Within 2 KM meters of the villa is the Canggu Club, offering sports, social and leisure facilities, and in the same location is a delicatessen, several good value restaurants, and a yoga studio complete with daily yoga classes, and a spa. At the nearby Echo Beach, guests will find a strip of restaurants and cafes set upon a beachside buff. Here, the Beach House restaurant offers indoor and outdoor seating, live music, and an extensive international menu, together with a daily barbeque. This is a fun social scene, especially around sunset. For horse lovers, the family-run ‘Kuda P’ stables is just five minutes’ drive from the villa, offering rides and tuition. The Nirwana Golf Course, designed by Greg Norman and renowned as one of the best golf courses in Asia, is a 20-minute drive. The nearby Berawa and Canggu Beaches are known for their world-class surf breaks, offering exposed reef breaks with consistent surf. The location offers easy access up to the mountains and rice terraces on the western slopes of the island; it is one hour’s drive from the famous cultural and artistic town of Ubud, and just 15 minutes’ drive from the Sunset Route, gateway to the eastern side of the island. The villa is 35 minutes’ from the international airport (depending on the traffic) and convenient for all of the Island’s main shopping malls and tourist attractions, including Tanah Lot, Bali’s most dramatic and venerated sea temple.